Everyone tries to keep their body in good shape, eat well, exercise and do what they can to stay healthy. Sometimes, life throws in a little wrench in the form of stretch marks, scars or dark spots and all of a sudden that body you’ve tried so hard to maintain seems less than what you want. Now, most people don’t care for stretch marks, or spots of any kind, so they look for any solution possible. Stretch marks are caused by the unnatural stretching of the connective tissue under the skin which causes the top layers of the skin to break and reveal the layers underneath. Scars are usually due to some kind of skin irritation, such as acne, breaking of the skin due to falls or breaks or any other kind of skin damage. Dark spots can be from sunburns, birth marks, freckles, or any other reason that caused excess melanin to gather in one spot on the body. Although there are quite a few options for getting rid of stretch marks, scars and dark spots, one of the best and least invasive ways is with essential oils. Essential oils are not only a safe and natural way to take care of any scars or stretch marks, but they are also quite effective at doing so. The best essential oils to use are those that are organic and as pure as possible which means that they will be potent. Therefore, the essential oils should be mixed with carrier oils to keep them from being irritating to the skin. Some good carrier oils include almond oil, apricot oil, apricot oil, jojoba, and carrot seed oil. Of course, you should always make sure before you start applying an oil regularly that you are not allergic to it so dab on an small area first. The following oils are great for stretch marks and any kind of scar or dark spot on the body. These oils help to lessen the appearance of marks, and fade them completely in most cases, but they will only do so in a longer amount of time. It will take a few weeks, if not months, for you to see complete results so don’t be discouraged if you don’t see results within a short amount of time. Essential oils are still a better option than going under the knife for surgery to fix marks on your body. 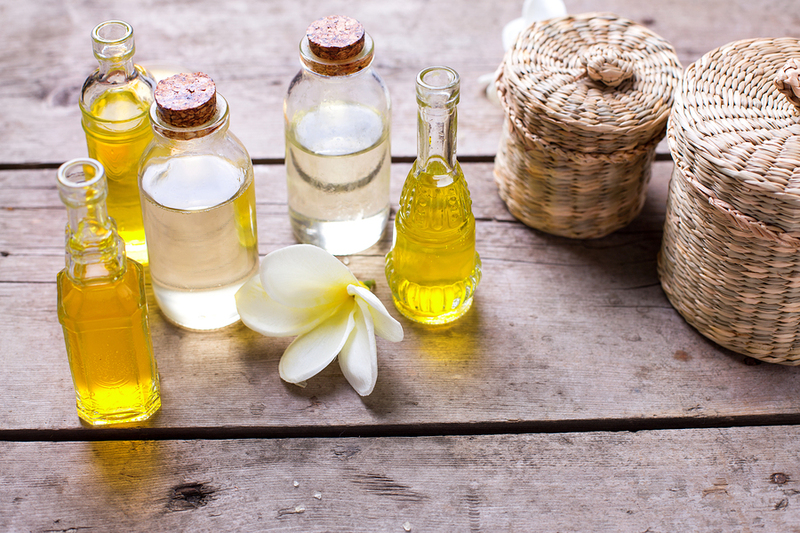 Read on below for a list of essential oils that will help with stretch marks, scars, or dark spots. One of the best oils for stretch marks, helychrysium oil is known as the everlasting oil because it comes from the silver-green leaves of an evergreen plant. This oil helps to improve the blood circulation and repair damaged skin but it is also a diuretic, astringent, analgesic, antispasmodic, and a very strong anti-inflammatory. The fact that it helps to repair damaged skin also makes it very helpful in its use against scars. Sage oil is steam extracted from the plant and it is one of the most beneficial oils for pregnant women to use. Pregnant women can use this oil as a preventative method against stretch marks or if they want to continue with healing methods against scars or dark spots. Sage oil is wonderful at promoting blood flow in the body and it can be used a few ways to be beneficial to the body. It can be used directly onto the skin by massaging or putting a few drops into a bath.